A 30 ml travel friendly bottle which you can easily carry in your hand baggage while traveling in air, you need not check it in the luggage. Such a Relief! 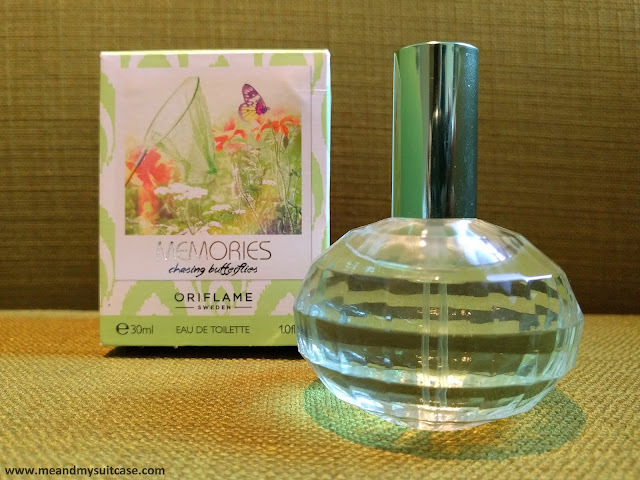 It is a cute little bottle and comes in 3 fragrances under the brand Memories by Oriflame viz. Memories daydreaming in a hammock, Memories chasing butterflies and Memories flirting under fireworks. I have been using Memories chasing butterflies Eau de Toilette for 2 weeks now and it is simply amazing. I can't think of any cons. It smells heavenly, make me feel like I am in a garden every time I wear it, among fresh flowers with quite breeze playing with my face and hairs. The best part is the size which makes it carriable. This INR 819 bottle is a must have. "Lose yourself in a cherished moment"